I do alot of walking in the Summer as I love to be outdoors when the weather is nice and exercise is important to me,as well as a good pair of sandals. 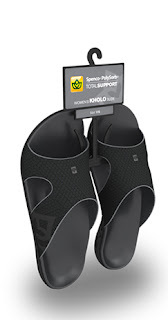 I recently came across some support sandals that really do feel different on my feet.Very comfortable.These are Spenco® PolySorb® Total Support Sandals.Unlike some other slip-ons, Spenco® Sandals are designed with orthotic-quality arch and heel support and there really is a difference. I normally wear a sandal that has strap around the back of the foot,so it doesn't feel like I'm losing my sandals when I walk, but with these, I really do feel the support without that back strap, and so, so comfortable. These sandals are available in a range of sizes for men and women, and three styles so you'll find it easy to be fashionable with your favorite color or styles with the choices they have. Spenco Footwear would love to give away one of these pairs of sandals for men or women to one lucky reader from Canada or the USA. ( Please note:winner may choose for man or woman, style and size, but color will be selected by Spenco.) A random draw will be held on July 14,2011 by Random.org from all entries recieved. I like the Kholo style. I like them all, but my favorite is the Kholo :) *Thanks* for the giveaway! I like the Yumi style! I like the Kholo sandals also. My favorite style is the Yumi, I love the toe flip flops! I like the Mens Fusion the best. The Yumi style is my favorite! Love the Kholo style, they look so comfortable.